"In Aug 2012 work on the long mooted wind farm was started at Penny Hill which is next to the M1/M18 about half a mile from Ulley. It is next to the M1 where it meets the M18. It will have six 132m high turbines, probably rated at about 5MW each. They should be a spectacular sight as you drive on the M1/M18. The access road is being built as at Aug 2 2012. They will cost about Â£22m and be operational in March 2013. They should generate enough power for about 12,000 homes." The above was written in Aug 2012. Now March 2013 has arrived and the gigantic turbines are being assembled. 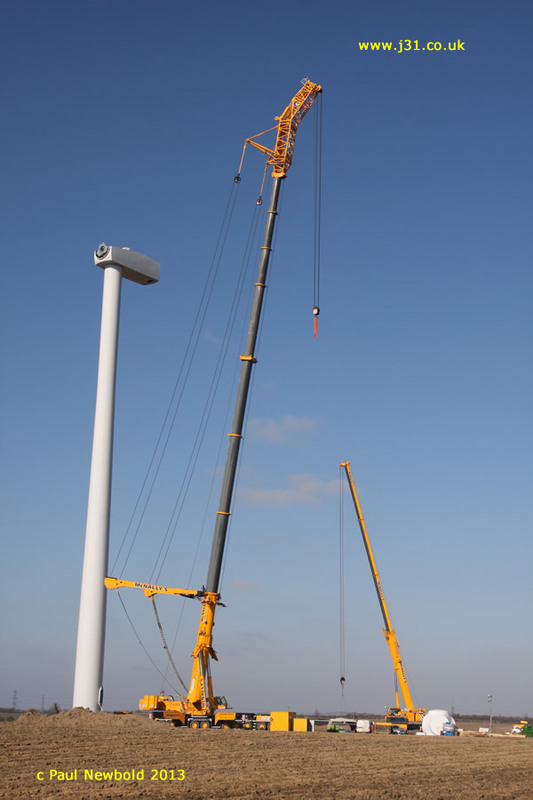 Below is a crane used to lift the gearboxes and blades 130 metres up. The blades have amazingly thick roots to bear the tremendous loads. To give it scale, the little white square bottom right is the back of a Ford Transit van. The van is dwarfed by the white dome like hub next to it. The hub will have the 3 blades attached to it. Above: blades on the back of a very very long flat bed truck. There was opposition from some (though not all) people in Ulley but their website seems to have been taken down now that planning permission has been given.